Another beach shot from my rainy weekend down south.Have been going through all my shots and deleting them by the dozen as my tripod had broken and was held together by a wing nut! !Broken tripod=out of focus shots.Oh well after i nearly wore out the delete button i had one that i could save so here it is.Need to get out and shoot as i have nothing to post. ~ by Mel on October 23, 2008.
i was waiting for someone to upload one of these shots….. i love it mel, maybe the ocean should have a bit more colour…..but other wise its great!! Love this shot too Mel. Yes, when are we gonna get some more shots for our blogs?? Yeah Clint this turned out ok.Pov could have been a bit better. 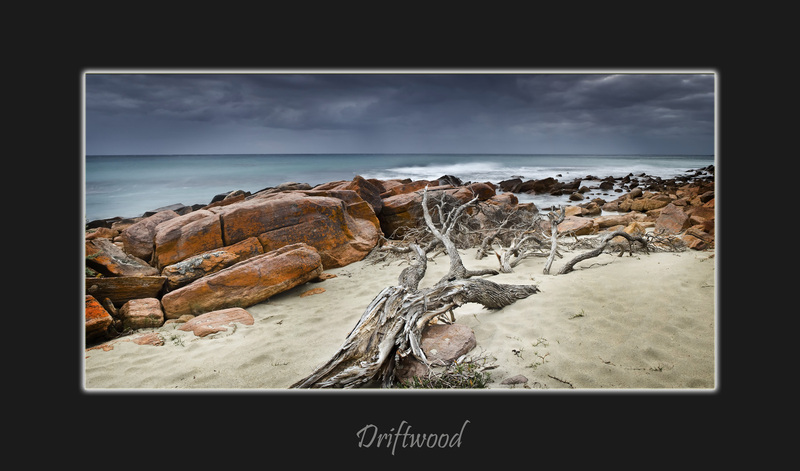 very cool Mel, a little selective accents on and around the driftwood would drag ones eye further into the image. Great texture Mel, and good detail captured in the foreground. Whilst I was away I was looking the idyllic piece of driftwood, and noticed there wasnt as much driftwood as there used to be. A conclusion I made was because it has been drought conditions for over a decade now, there has been not as many floods and not enough freshwater to flush debris through the estuaries. Funny you should say that Luke I felt like you were there too!